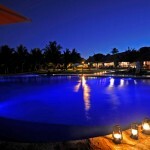 The Lamu House Hotel and Wellness Centre is located in Shela, on the island of Lamu in Kenya. This hotel has its own spa and wellness centre. 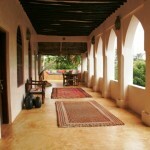 The hotel is decorated in a traditional Swahili style. There are several large halls with hammocks and sofas for guests. The hotel has six double rooms and a penthouse, and each type of accommodation has its own bathroom and WiFi. The Banana House is located on the hotel’s territory. This house has three mansions with sixteen rooms, each one of them with its own bathroom and views towards the tropical gardens. There are individual rooms, double rooms, two large family suites and two penthouses. Guests can rent rooms, floors and the whole house. This hotel has six double rooms. There are double rooms with two twin beds and double rooms with double beds. The standard rooms are located on each building’s ground floor. Each double room has a kingsize bed and a bathroom. There is a lounge area on each floor, with a dining room and a living room that has views towards the gardens and the sea. Guests will be able to enjoy meals on the terrace. An individual room costs around 80€ per night. A double room has a price of 115€ per night, and price includes breakfasts and airport transfer. The family rooms are formed by connecting two rooms. Each room has a large double bed and its own bathroom. The terrace has direct access to the pool. The Banana Penthouse is located near the rooftops. This penthouse has a ceiling covered in leaves of palm trees, a double room and a bathroom. The terrace has a large traditional Swahili hammock and several armchairs from where guests will be able to enjoy views towards the gardens and the sea. The Banana Penthouse has a price of 165€ per night. 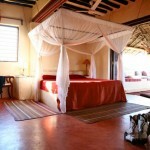 The Sweet Banana Penthouse has a large kingsize bed carved with Swahili designs. This rooms has views towards the sea and a price of 165€ per night. The Wellness Penthouse is the largest of the three penthouses. This penthouse has two rooms with a bathroom each. The penthouse has views towards the dunes and the sea, and the terrace has two hammocks. The Banana Wellness Penthouse has a price of 210€ per night. The hotel has a large kitchen. The cooks can prepare regional dishes and international dishes for lunch and dinner. Guests will be able to try a variety of local dishes, ranging from crab and tuna carpaccio to barbecued fish. The hotel’s kitchen uses organic ingredients and the hotel has its own organic farm. Most of the ingredients and the meat come from local farms, and the sea products come from nearby fishing villages. 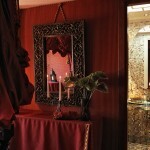 Vegetarian dishes and other special dishes can be prepared on request. The hotel’s own spa center is located on the ground floor. The spa was built around a large acacia. There is a meditation room, Shela, located on the top floor of the spa, a room built using recycled bottles that has views towards the dunes, Manda Island and the sea. Most of the rooms have views towards the dunes, the hotel gardens and the sea. 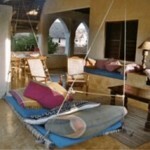 There are several terraces with hammocks and sofas. The hotel’s swimming pool is located in the exotic garden, and one area of the pool is for children. The hotel offers a range of sports activities and guests will be able to explore the exotic gardens, filled with tropical plants. The hotel offers a shuttle service to and from the airport. The Banana House can be rented by groups of guests to celebrate conferences and family events. The hotel offers a catering service on these occasions. 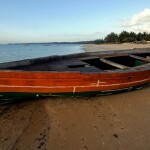 The hotel is located in the village of Shela on Lamu Islands. 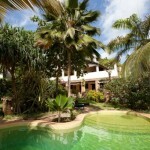 Guests can visit the town of Lamu, which is located near one tip of the island. There is a white, sandy beach and dunes next to the hotel. Guests can visit nearby villages and walk around the city. After exploring the city, they can relax on the Shela beach. There are many activities guests will be able to enjoy in the regions. Guests will be able to enjoy a traditional dinner in a dhow, a Swahili dinner and an afternoon in a Swahili village. Guests can fish and watch the turtles. 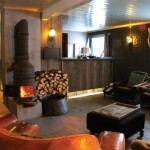 The Knockomie Hotel is located in the city of Moray, in Scotland, in the United Kingdom. The ancient stone mansion is now a hotel where each room has its own design. This ancient villa has several suites. 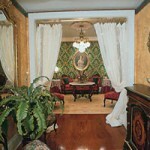 Each one of the suites has ancient style décor with iron-wrought double beds and a private bathroom. 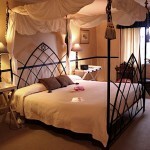 The hotel’s double rooms have iron-wrought double beds. These rooms were decorated following the building’s structure, with stone walls and large windows. Price is aorund 160€ per night. Part of the double room have a private patio with access to the hotel’s gardens. The Grand Master double rooms have queensize and kingsize beds with views towards the hotel’s gardens. 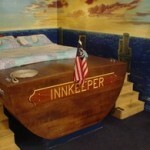 One of the rooms has a bed decorated with yellow covers. Another room has tartan decorations, the symbols of the Fraser and Grant clans and antique decorations. 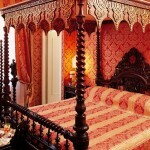 The Four Poster rooms have antique four poster beds. One of these rooms is Aberlour and the other one is Benromach. The Benromach room follows a colonial theme. There is traditional Indian furniture, and many of those pieces could be seen in the tea plantations. The Aberlour room has a more traditional Scottish theme. 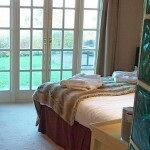 This room has views towards the garden and Forres and Findhorn. There are several themed suites at this hotel. The Glenburgie room has a Scandinavian décor with light, wooden furniture. There is light control and a designer bathroom. The Balvenie room is an Indian room. The room was designed using bright red and golds and traditional Indian furniture. Price is around 152€ per night. Breakfast, lunch and dinner are served at the hotel’s restaurant. Guests will be able to enjoy authentic Scottish breakfasts. The hotel’s restaurant is the Scottish Highland. Here guests will be able to enjoy lamb and a variety of other traditional Scottish dishes. 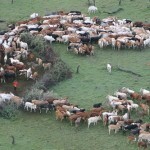 The veal comes from farmers in the nearby city of Forres. These butchers are known for their ecological savoury meat. The restaurant offers grilled dishes. Guests will be able to enjoy ecological meat, fresh vegetables and fresh grilled salmon. There is a bar next to the hotel’s restaurant where guests will be able to enjoy a selection of whisky and wine. Guests will be able to savour several types of malt whisky. Guests will be able to celebrate private events in one of the many halls located in this ancient mansion. 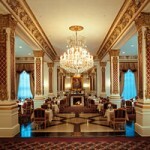 The hotel can organize private dinners for groups. The Malt Library is a hall where guests will be able to enjoy more than 80 types of malt whisky. Whisky tastings are organized in the afternoon. The hall is decorated with leather armchairs and has a large fireplace. Guests can tour the nearby distilleries. The hotel is located near the town of Moray, in Scotland. 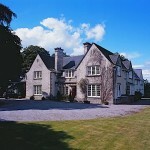 Guests can enjoy long walks in the countryside and explore the nearby castles. The ancient villa has a large garden designed for afternoon walks. The city of Inverness is located a short distance away. Guests can explore the castles of Brodie, Cawdor and Uquhart. Trips can be organized for those who want to visit Loch Ness and other lakes. There are several golf courses near the hotel. Guests will be able to participate in golf competitions. The nearest golf courses are Elgin and Forres. Guests will be able to participate in many other activities, from golfing and countryside walks to riding a bike and fishing. The Hix Island House Hotel is located on the island of Puerto Rico. The concrete houses have lofts with views towards a butterfly reserve. The rooms were built using concrete and are decorated with dark furniture and colourful designs. 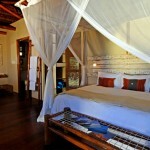 Each room has a bed, a bathroom and views towards the sea, the butterfly reserve and the rest of the garden. Casa Solaris has six lofts. The first and second lofts are located on the top floor of the house. Each loft has a kingsize bed that can be transformed into two individual beds, an exterior shower, a kitchen with a patio and views towards the ocean. The third and fourth lofts are located on the second floor of the house. These two lofts have a double room each, a large bathroom with an outdoor shower, a patio with a lounge area and views towards the ocean. The fifth and sixth lofts are located on the ground floor and are the largest lofts at the hotel. Each loft has two double rooms, and each double room is quipped with a bathroom and an outdoor shower. The lofts have a living room with a kitchen, a patio with a lounge area and a dining room with views towards the hotel’s garden. The Casita is a villa located next to La Casona. This villa is located on a hill and has a room with kingsize bed, a bathroom with an exterior shower from where guests can enjoy ocean views, a kitchen and a patio with a dining room area. 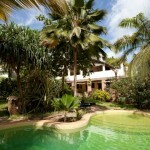 La Casa Redonda is a circle shaped villa with several lofts. Lofts 1 and 2 have a kingsize bed, a bathroom with a double sink and an exterior shower, a kitchen with a dining table and a patio with a hammock and a lounge. Lofts 3 and 4 are located on the second floor and have a kingsize bed, a bathroom with an exterior shower, a kitchen and a patio. Lofts 1 and 3 have ocean views and lofts 2 and 4 have views towards the patio. La Casa Triangular is a triangular building located on the hotel’s territory. The Matisse Loft is located on the top floor and has a queensize bed, a bathroom, a kitchen, a patio with a lounge and ocean views and a staircase that leads to the rooftop of the building. The Adobe Loft is the loft located on the ground floor and has a kingsize bed, a bathroom with an exterior shower, a patio with a lounge and garden views. The Studio Loft is located on the first floor and has a kingsize bed, a bathroom with an exterior shower, a kitchen and a lounge that leads to the patio, which has ocean views. La Casa Rectangular has several lofts, and each loft has a kingsize bed, a bathroom with an exterior annex where the shower is located, a kitchen and a patio with a dining room. Lofts 5 and 6 are located on the top floor and have ocean views. Lofts 7 and 8 are one floor below and have garden views. The Gallery Loft is located on the ground floor and consists of a large suite adapted to guests on wheelchairs, with a kingsize bed that can be transformed into two twin beds, a bathroom with a shower and a kitchen that leads to a private patio. 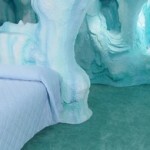 Price varies between 100 and 538€ per nights. Price includes cotton clothes for each guests. There is WiFi next to the reception areas. The hotel does not have its own restaurant. Each loft has its own kitchen that comes equipped with cereal, a selection of tea and coffee, fresh fruit, eggs, milk, jams, bread and juices. The houses and lofts are located on a set of hills. The hotel’s swimming pool is a designer pool where guests will be able to relax while enjoying views towards the sea. The pool has solar panels for heating. 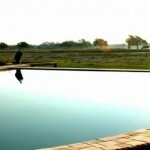 The pool does not use any chemical products and is disinfected using copper and silver ions. Guests are provided with hammocks for the beach. 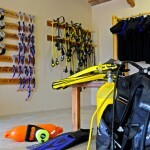 Guests have snorkel equipment at their disposal. La Casona is located on top of a hill on the hotel’s territory. This large building can be used for events of up to 80 people. The villa has several halls that can accommodate private dinners and conference halls, and the hotel can provide a catering service for those guests who do not want to use the kitchen. La Casona has views towards Isla Vieques, the Bioluminescent Bay and the Caribbean. The hotel is located on the island of Vieques, to the south of Puerto Rico. Guests will be able to enjoy long walks along the shore of the Caribbean and participate in trips to nearby natural parks. This hotel is an ecological place that tries to increase the awareness of recycling. The houses and villas use solar energy and water cisterns. The water in the shower is heated using the solar panels. The water that is not used for the showers and in the toilet is drained and is later used to water the plants. The beaches located closest to the hotel are Sun Bay Beach and the beaches of Refugio de Peces and Vida Silvestre on the east coast of the island. Guests will be able to rent cars in order to explore the beaches, restaurants and nearby shops. The Herangtunet Hotel is located in the town of Heggenes, in Norway. This rural house has been transformed into a hotel where each room is decorated according to a country. The hotel has an apartment and nine double rooms and designer suites. Each room has a large bathroom, a rustic décor and windows that have views towards this village. 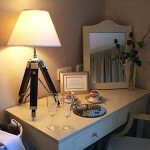 Each room and suite has a large double bed, a private bathroom with a shower and coffee and tea making machines. The hotel provides slippers for guests who stay at the hotel. The hotel has several apartments that have double rooms, a bathroom and a kitchen. The five themed rooms and the four designer suites are dedicated to several cities, countries and regions. The Norway room is a studio room decorated with large tree trunks. The bed is covered with large fluffy pillows, covers and deer skins. The leather sofa is located next to the log fireplace. There is a wooden kitchen and a dining table. The room’s bathroom has a shower. The France room is decorated in a Louis XVI style. 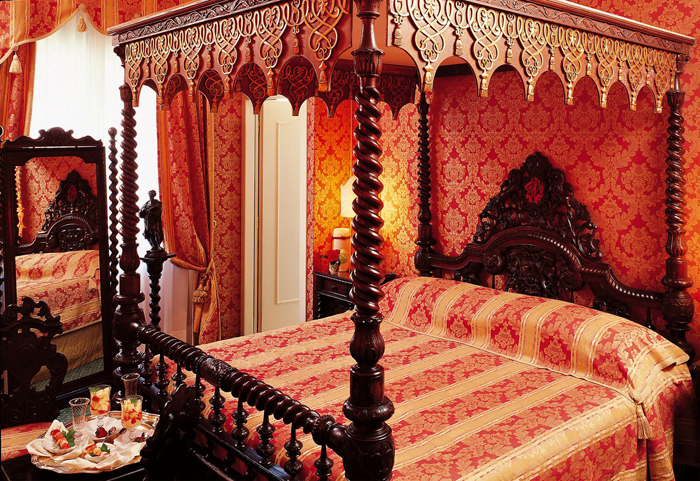 There are bright decorations and a large four poster bed covered with a velvet cover and several stacked pillows. 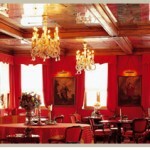 The room has its own vintage boudoir, a colourful crystal chandelier and a carved wooden table next to the fireplace. The bathroom is decorated with wooden panels and the sink has copper faucets. The Holland room is covered in wooden panels and was built based on the traditional, Dutch hose design. The room is decorated in blues, greys and whites. 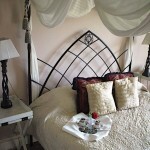 There is a double bed and the area above it is decorated with black and white paintings of tulips and windmills. Next to the fireplace guests with find antique sofas. The Iceland room is decorated with light coloured wood. The furniture and the room’s decorations were made of natural materials. Part of the room is dedicated to the Northern Lights, and next to this mural guests will find the bathroom, which has a bathtub. The Sweden room is a family room. 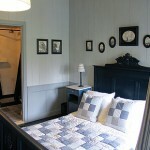 The master bedroom has a double bed covered with a traditional broderiekatoen and next to it there is a fireplace. The other room has a bunk bed covered with colourful covers. These two rooms have access to the bathroom. 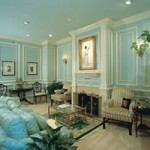 The New York Suite is a suite decorated with designer furniture. The bathroom was built using cement and stainless steel. The suite is decorated in neutral tones. The living room area has a thick carpet and a fireplace. There is a kitchen with a minibar, microwave and a refrigerator. The Rome Suite has handcrafted dark furniture. This rooms is decorated with silks and green and purple velvet, and there are fresh flowers on the tables. 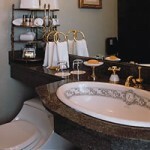 The bathroom has an Imperial style, with golden murals, mosaics, a large bathtub and frescoes decorating the ceiling. At the Aspen suite, which has a rustic décor, guests will be able to enjoy the views towards the mountains. 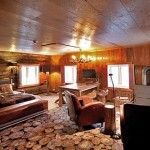 The suite has leather furniture, wooden tables and furs, and there is a fireplace next to the large leather armchair. The bathroom has a wooden bathtub and a hydromassage shower. The London Suite is a suite with antique furniture and chic decorations. The marble bathroom has chrome taps. This room is has velvet covers and there is a living room with a fireplace and leather armchairs. The hotel has its own restaurant, decorated with a large log fireplace. Guests will be able to enjoy local dishes, including deer meat and other regional delicacies. 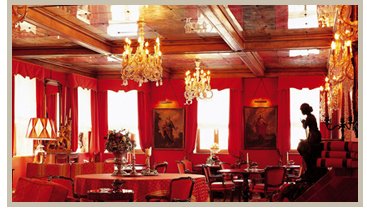 The hotel’s building is an ancient mansion built in the traditional Valdres style. Next to the mansion there are several traditional buildings that were brought here from other regions to show the architectural diversity. There is a relaxation area at the hotel. Guests will be able to enjoy several skin treatments and relax in the hotel’s jacuzzi and traditional sauna. The hotel has a large garden with a terrace from where visitors will be able to enjoy views towards the mountains. The hotel has views towards the fjords. The hotel’s restaurant is equipped with several long, wooden tables. Guests will be able to organize private dinners and events at the restaurant. The hotel can organize group activities. Guests will be able to enjoy snow sports, navigate the fjords in a canoe and explore the nearby towns in a snowmobile. The hotel is located in a traditional Norwegian home made from wood in the village of Heggenes. Near the hotel there are many natural attractions, fjords, mountains and the Beitostolen ski resort. The hotel is a short distance away from the Hegge fjord and the Jotunheim mountains. The village is located 500 meters above sea level and has views towards the mountains. Nearby guests will find several natural lakes. A short distance away from the village is Fagernes, a town in the valley of Valdres. The hotel can organize trips to nearby towns and tours to see the fjords and the mountains. Guests will be able to enjoy many sports activities in this region. Canoeing and fishing are two of the activities offered. 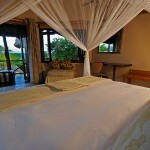 Richard’s Camp is a safari camp located in the Masai Mara Natural Reserve in Kenya. This camp has several traditional tents with solar panels. This hotel is a large camp with six traditional tents. 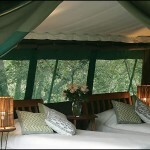 Each tent is a suite with a double bed and a private bathroom, with rooms decorated with local furniture. There are suites with twin beds and suites with double beds. Families will be able to request another bed. 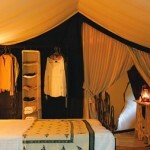 Each tent has a traditional African style, with ochre decorations and wooden furniture. Price is around 495€ per night. This hotel is an ecological hotel. The tents use energy that comes from the solar panels installed on the hotel’s territory. The solar panels provide electricity to the tents. 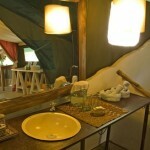 Each tent has its own bathroom with a shower. On the hotel’s territory there is another separate house. 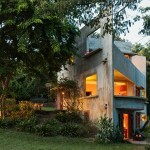 This private house was designed for families and groups of up to ten people and has views towards the natural reserve. Guests will be able to enjoy traditional breakfasts, lunches and dinners made with local ingredients at the hotel’s restaurant, which has views towards the animals. Lunch is served in the hotel’s dining hall, which has a barbecue area where a camping fire is lit in the afternoons. The dining hall has several sofas where guests can relax after dinner. 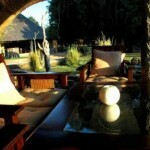 During the safaris guests will be able to enjoy traditional picnics prepared by the hotel. 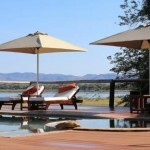 The hotel organizes dining trips to lagoons where guests will be able to see hippos. 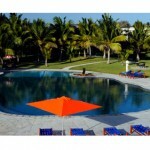 The hotel can organize excursions and safaris for groups. After exploring the territory, guests will be able to relax at the camp. There is a large Victorian tub on the hotel grounds that can be used as a jacuzzi. The bathtub is decorated with candles and has views towards the prairie. 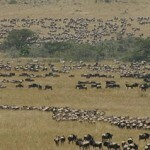 The hotel is located in the south of Kenya, near the Masai Mara Natural Reserve. This natural reserve is one of the region’s most visited places where guests will be able to see the Big Five. The hotel is around two hundred kilometres away from Nairobi. There are flights that connect the hotel to the city, and the hotel has its own landing strip. 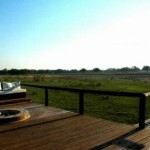 The camp has views towards the prairie where guests will be able to see local animals. Near the camp there is a small river and a path where guests can walk and interact with some of the local animals. Guests will be able to enjoy the views towards the national park and observe many local animals. 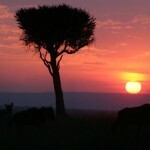 There are many safaris around that region, where guests will be able to see elephants, impalas, large felines and zebras. Some of the hotel’s guides offer guided walking tours around the hotel grounds, and the hotel offers Jeep safaris and game drives. The Big Five, the African buffalo, the African elephant, the cheetah, the lion and the black rhinoceros, can be found in the region. Guests will be able to enjoy cultural tours around the Masai Mara villages. Part of the price of each tour is destined to local development projects and conserving the region. The hotel can organize trips to Lake Victoria, located a short distance away. Guests will be able to visit many traditional villages. Another typical activity in the region are hot air balloon safaris. 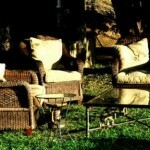 Guests will be able to enjoy night safaris and long distance safaris that include a traditional picnic. The Metropole Hotel is located in Venice, in Italy. Located in an ancient palace, the antique decorated rooms have views towards the lagoon. This hotel has 67 rooms. Each room is a double room decorated with antique furniture and art, and has large windows with views towards the lagoon. Price varies between 210 and 1585€ per night. 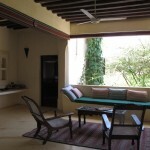 Some of the rooms have a private terrace. Each room is decorated with gilded masterpieces, and each piece has its own history. The rooms and halls are decorated with furniture dating from the renaissance, oriental carpets and art déco decorations. Windows are decorated in a Venetian style, with silk and velvet. 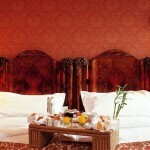 The standard double rooms are decorated as ancient Venice, with carved furniture and cream and red coloured textiles. In each room there is an ancient, hand painted fans decorating a wall, belonging to the hotel’s private collection. Room have views towards the inner courtyard, the Rio della Plata canal and the commercial streets. Each double Deluxe room has its own décor, some with Art Déco furniture, others with decorations from the Renaissance and others with an exotic flair. Many of these rooms have views towards the city. The Junior Suites are spacious rooms with a living room with a coffee table, sofas and views towards the lagoon. Some of the suites have private terraces where guests can enjoy a coffee with views of the city’s rooftops. These rooms are decorated with art masterpieces and bronze and red textiles, and silk cushions give the bed a splash of colour. 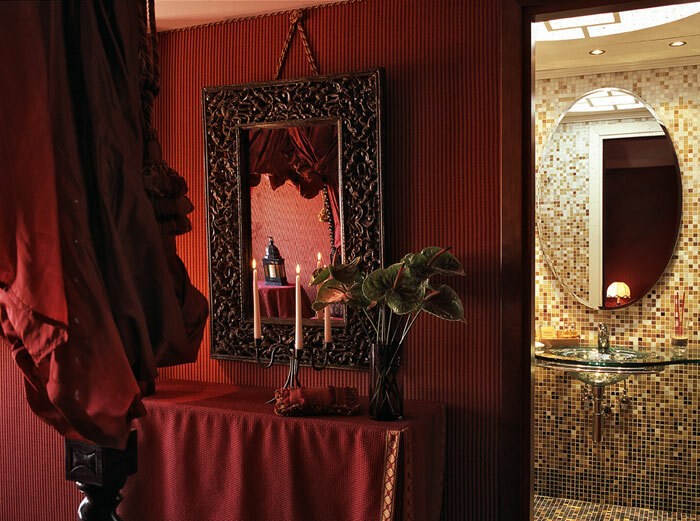 The large bathrooms are decorated with Italian marble and mosaics, and have windows and bath products that include aromatic candles and incense. The Metropole Suites have a separate living room with armchairs and sofas, a coffee table and views of the inner courtyard. The suites are decorated as small Venetian palazzos, with antique furniture, art pieces from the hotel’s private collection and walls covered in silk and velvet. The bathrooms have large windows and amenities that include candles, incense and bath salts, and some rooms have bathrooms made from Italian marble while other rooms have bathrooms covered in mosaic tiles, and guests can choose bathrooms with a bathtub and those with a shower. The suite has bathrobes and slippers for guests. 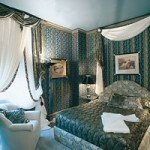 The hotel’s trademark rooms are the Damasco, Dei Nobili, Desiderio Gli Angeli, Porta D’Oro and Queen Anne. Each one of these large rooms is decorated according to the theme following the room’s name, and all of them have silk and velvet hangings, antique crafted furniture belonging to the hotel’s private collection and art pieces. The Met restaurant is the hotel’s two star Michelin restaurant. The restaurant is known for its décor and design, and is known for its variety of entrées, main dishes and desserts, all of them accompanied by a wine list which includes wines from the hotel’s cellar. On the ground floor is the Oriental Bar, a bar decorated with wooden panels and white candles which has views towards San Giorgio island. The Tea Ritual is a tradition at this hotel, where each evening guests can enjoy a selection of teas from distant regions, including Earl Grey, Oolong and Pai Mu Tan Ninfa Igeria teas accompanies by a range of finger sandwiches. Shortly after Easter guests will be able to relax in the Citrus Gardens, a garden filled with jasmine and illuminated by candles. The restaurant can serve meals in the garden. 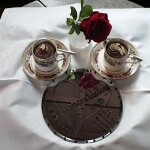 The hotel organizes tastings of cocoa based products. Guests will be able to participate in the tastings and try many appetizers, including several varieties of cheeses and hams accompanied by cocktails, and on some afternoons enjoy live music in the lounge. The hotel has a private entrance for water taxis. Guests will be able to enjoy massages directly in their rooms and buy local perfumes at the hotel’s boutique. There are several conference rooms where guests will be able to organize events, and banquets can take place in the inner courtyard. There is a meeting room with a capacity of up to 25 people. This hotel has been visited by many artists, authors, celebrities and singers. Marcel Proust, Sigmund Freud and Thomas Mann have stayed at this hotel. The halls are filled with large glass cabinets that hold part of the hotel’s antiques collections, which includes clutches worn by the ladies during cocktails and society meetings, carved boxes where the visiting cards were kept and other vintage decorations. One of the upper floor has a large collection of hand made hand fans. Guests will be able to tour the building, which is filled with art pieces and furniture that used to belong to Venice’s most prominent citizens. 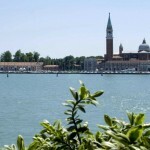 Stepping out of the hotel guests will find the lagoon of Venice. 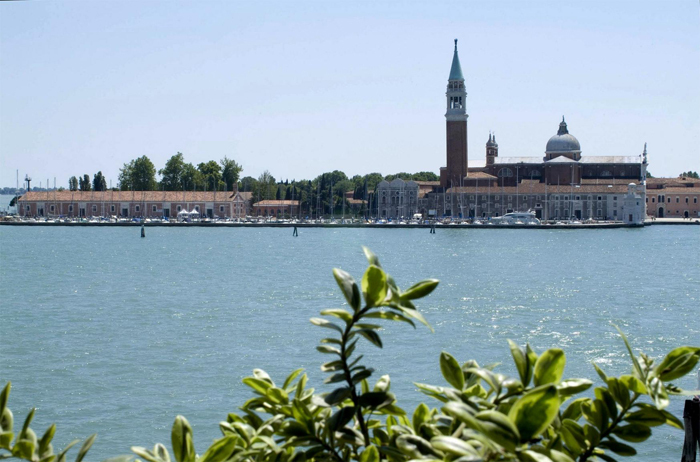 A short distance away is St. Mark’s Square, the city’s most visited square, and the building where the Art Biennale is celebrated, known for its views towards San Giorgio island. There are several golf clubs outside the city, and the coastal resorts are a short ride away. 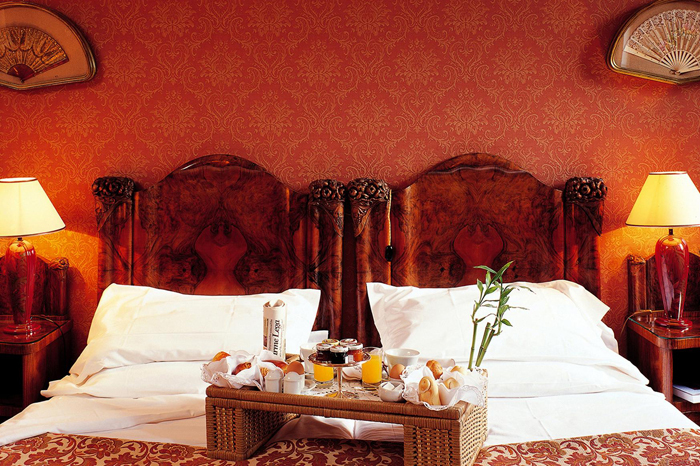 The hotel is a prime location for those who visit during the Carnival of Venice and the Venice Film Festival. 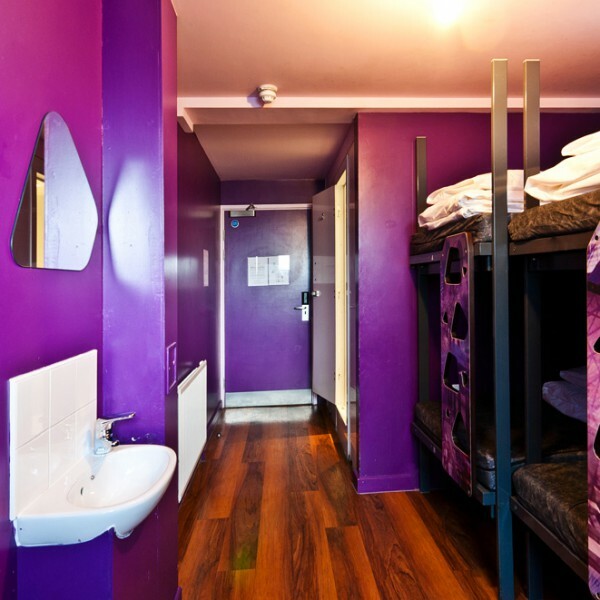 The Clink 78 Hostel is a hostel located in a courtroom near King’s Cross Station in London, England, in the United Kingdom. 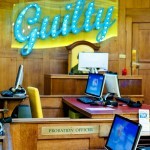 The old courtroom has been remodeled into a hostel with large rooms and Internet access. Each bedroom has a locker and a safe for each guest. The reception area has vending machines and is open all day long, an option designed for guests who arrive late. 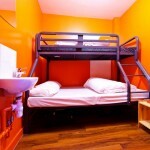 The hostel has special prices for groups of more than 15 people. 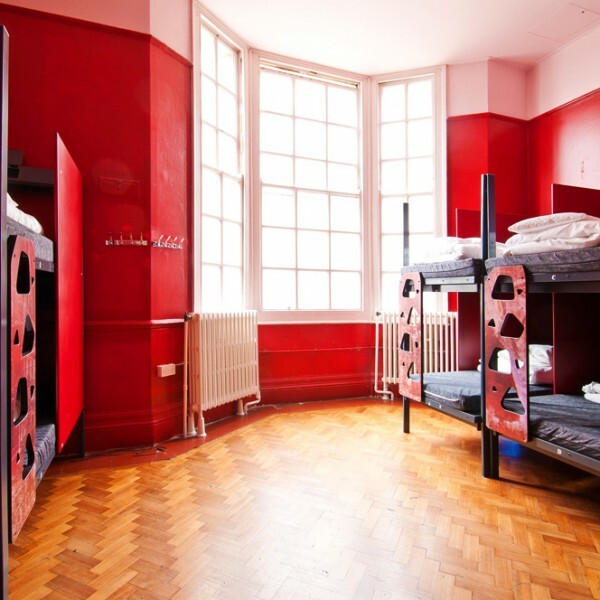 The hostel’s bedrooms come in several sizes and can accommodate from 4 to 16 people per bedroom, where each bedroom has bunk beds and each bunk bed has its own light and locker. Some bedrooms, with a cost from 10€ per person per night, have their own bathroom, and others have a shared bathroom in the hall. 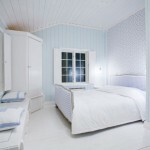 Some rooms are designed for girls only and are painted in pastel colours, with a price of 11€ per bunk. These Deluxe rooms are located inside what used to be the Police Station and are designed only for girls, with hair dryers, large mirrors on the walls and larger wardrobes. Guests will be able to stay in the old jail cells, which have been remodeled into double rooms conserving the same structure, bars on doors and paintings on walls as when the hostel was a Magistrates Court, for 57€ per night. The rooms with a private bathroom can be individual, double or triple rooms, and the price starts from 45€ per night. Price includes bed linen and a continental breakfast. Guests can use the luggage storage room where they can store their suitcases even after check out. There is a laundry room and a shop that sells all the necessary travel equipment, from toiletries to padlocks, where guests can get their free map of the city and purchase West End show tickets. 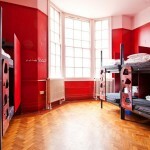 The hostel offers free tours that go around London’s landmarks and monuments. There is an equipped kitchen where guests will be able to prepare their own food. 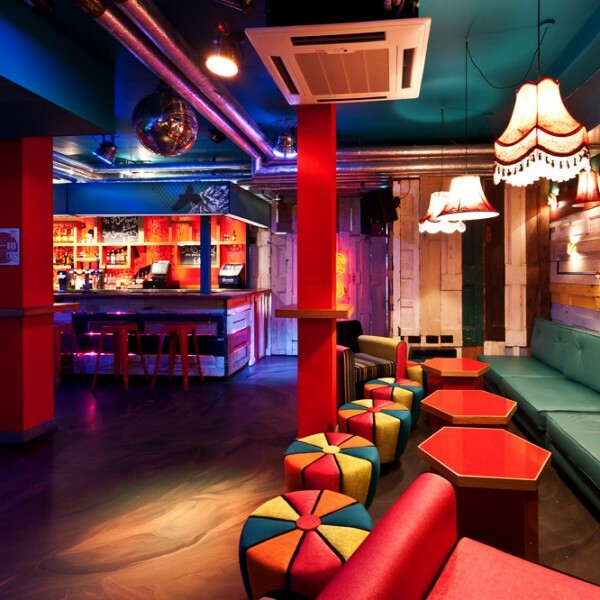 In the common areas guests will find the Clashbar, a bar with affordable prices where events such as karaoke nights, table football competitions, pool championships and disguise parties are organized. One court room has been converted into a lounge with couches and a large flat screen television. Another court room is now the Internet room with several computers and Internet access. The Clink 78 Hostel combines more than 200 years of history with the latest design. The hotel has managed to preserve the hotel’s two court rooms and seven jail cells. The courtroom that is now the television lounge was the place where The Clash had to stand in the dock for shooting prize winning pigeons, and the courtroom that is now the Internet room is said to be the place that inspired Charles Dickens to write Oliver Twist. This Magistrate’s building is more than 200 years old. 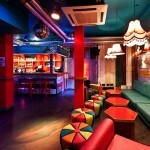 The hotel is located only 10 minutes away by foot from King’s Cross Station and St. Pancras. The building is located in central London, and it a short underground trip away from the airports, railway stations and the Eurostar.